If you’ve been waiting for a way to do AirPlay Mirroring from your iPad (or iPhone) to a Windows PC, then your wait is now over. Reflection App, which I posted about back in early March when it was Mac only, has released a Windows version. AirPlay Mirroring, as the name implies, lets you mirror everything you do on your iPad to your PC screen, wirelessly. It’s a superb way to do demos and show an audience everything you are doing on an iPad. I’ve used Reflection and Air Server for doing demos and screencasts, and both are very good apps. This new Windows version of Reflection supports the iPad 2 and later, and the iPhone 4S. It’s priced at $19.99 or $59.99 for a 5-person license. You can download a trial version of the Windows app, which is time-limited – you can’t have a connection longer than 10 minutes with the trial version. I gave the trial version a try on my Windows 7 virtual machine on my MacBook Pro but couldn’t get mirroring going even though the iPad and PC saw each other. I imagine this is due to having a virtual machine in the mix. For more details, trial download and to purchase the app, visit the Reflection app site. I spotted this news via Erica Sadun’s post at TUAW. The latest Changewave survey of consumers on tablet demand shows the iPad is still the device that nearly 3/4 of users plan to buy, and no other tablet is even close. 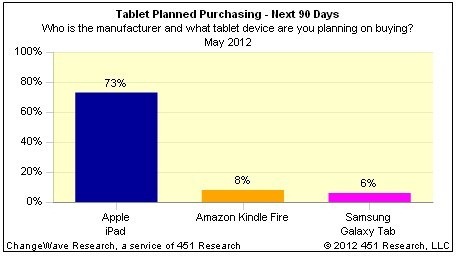 As you can see in the chart above, 73% of respondents list the iPad as the tablet they plan on buying. Coming in a distant second is the Amazon Kindle Fire at just 8%. The Samsung Galaxy Tab is in third place, with just 6%. The Blackberry PlayBook doesn’t even merit a mention or a spot on the chart. Windows 8 tablets don’t either. Another part of the survey that reinforces just how dominant the iPad appears to be in this sort of mindshare area is a question about a possible iPad Mini. Changewave offered respondents a likely description of the iPad Mini and asked whether they would plan to buy one for themselves or someone else (e.g. a family member) – 3% said they were very likely and 14% said they were somewhat likely. So, for now it looks as if an alternative iPad model might offer stiffer competition than any rival tablet. I got this lovely Father’s Day themed promo email from Apple this morning – touting the iPad as ‘The gift Dad won’t take his eyes off of’ – and featuring Bruce Springsteen’s new album, Wrecking Ball, as well. 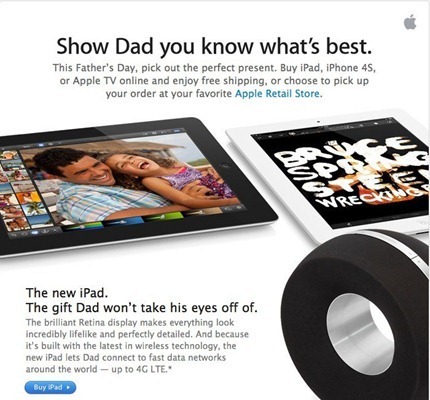 Are any of you planning on gifting an iPad to a lucky father this year? iPad Absence Makes the Heart Grow Fonder? I very rarely spend a day without spending good chunks of time with the iPad. My family and I take very rare and very short vacations over recent years and generally my iPad comes along with us and I still work a little during down time. So today will be a bit of a strange day. My wife and daughter and I are heading to Sea World for a day trip to celebrate the end of the school year. We’re all very psyched up for the trip – especially my daughter who is going for the first time ever. And the iPad will not be coming along, as it’s going to be a long, wet day. 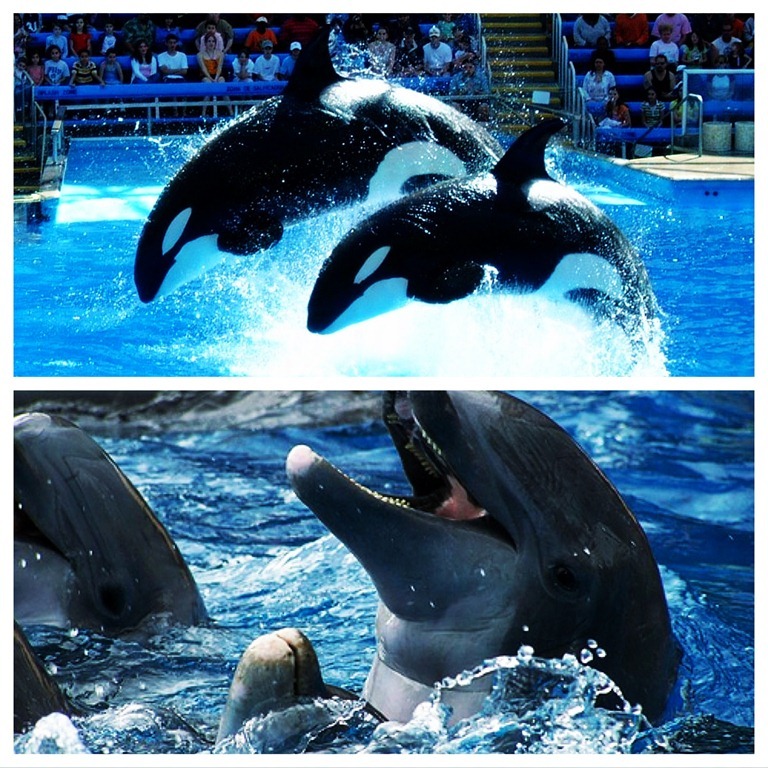 I’m pretty sure Sea World will provide more than enough fun to keep me from missing the iPad. Oh, OK – maybe I’ll miss it a little. I should be back to regular posting on Friday. Tim Cook did a lengthy interview at AllThingsD’s D10 conference last night, and of course he had lots of interesting things to say about many of Apple’s leading products. He had plenty of interesting things to say on the subject of tablets as well. You can do things with the tablet if you’re not encumbered by the legacy of the PC, if you view it as different. He also mentions that if you pull over too much of the ‘leg weight’ of the PC market then maybe you end up with something not too far off the tablet of ten years ago. And of course that’s the sort of tablet that never gained any traction with users and never had any great market impact. 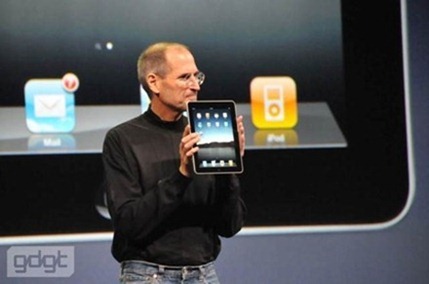 Cook also talks about how Apple did not invent the tablet – but quickly adds ‘”We invented the modern tablet”. The whole video is well worth watching, and I think Cook’s points are very well made, and to me suggest that Microsoft still doesn’t really ‘get’ the tablet arena they’re about to enter. I just got this promo email from Apple this afternoon. It suggests that an iPad would make for a marvelous Mother’s Day gift. The new iPad, with its stunning Retina display and 5-megapixel iSight camera, will let Mom see — and do — everything like never before. A fine suggestion if you have the sort of budget that allows for this level of gift and a mom who’s in need of a great tablet device. Oh, and depending on how young/old and how tech-savvy/tech-novice your mom is you might want to budget for some time explaining what a retina display is, and what 5 megapixels means, and all the other questions you may be fielding. 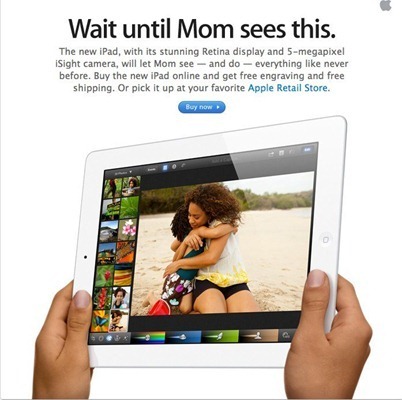 Are any of you planning on the iPad as a Mother’s Day gift? How Much Do You Watch Major Sporting Events and TV in General on the iPad? MG Siegler wrote a short post at his ParisLemon blog on Sunday, titled The Future of Watching Major Sporting Events. He defines that future in one word: iPad. He wrote it on the final day of The Masters and was obviously enjoying the The Masters official iPad app. I’m sitting here on my couch watching the Masters live — not on my television, but on my iPad. And I can switch to other video feeds depending on which players/holes I want to watch. 6 different feeds are live right now. I can watch highlights right after they happen. I can check scores. I can read bios. I can see photos. I can get an overview of the course. 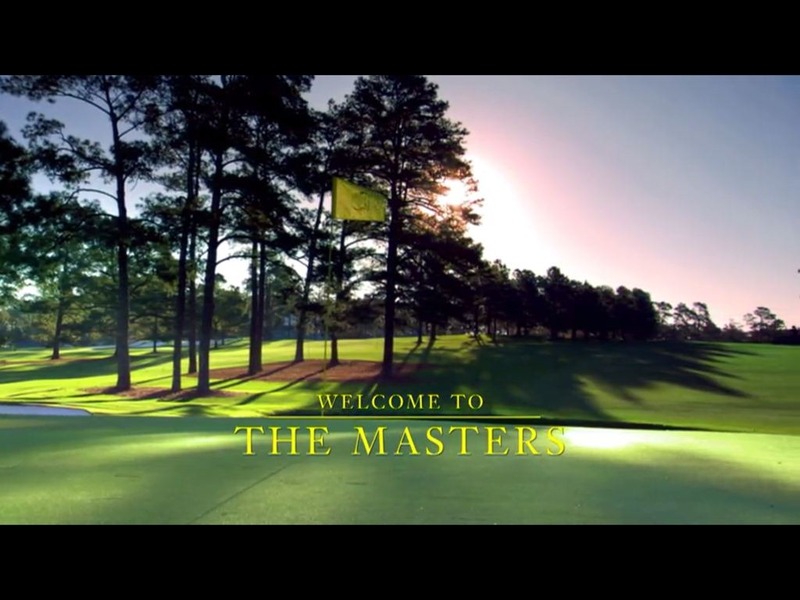 I can read about the history of the Masters. Etc. Etc. Etc. I definitely agree that there are some excellent iPad (and iOS) apps now for some of the major sports and sporting events. The Masters app is a good example. So are MLB At Bat, NCAA March Madness Live, and NBA Game Time Courtside. There’s also a very good one for Wimbledon. I wouldn’t say I prefer watching major sports events on the iPad over a big TV screen – but I do enjoy using these titles as companion apps while watching or for when I’m not around a big TV. I watched a lot of The Masters on Saturday and Sunday – while playing a baseball management game on my iPad. Do you watch a lot of sporting events on your iPad? How much TV of any kind do you watch on the iPad? USA Today has a story up today that offers a perfect illustration of when the iPad lives up to its ‘magical revolutionary’ billing, that Steve Jobs gave it when first unveiling it back in 2010. 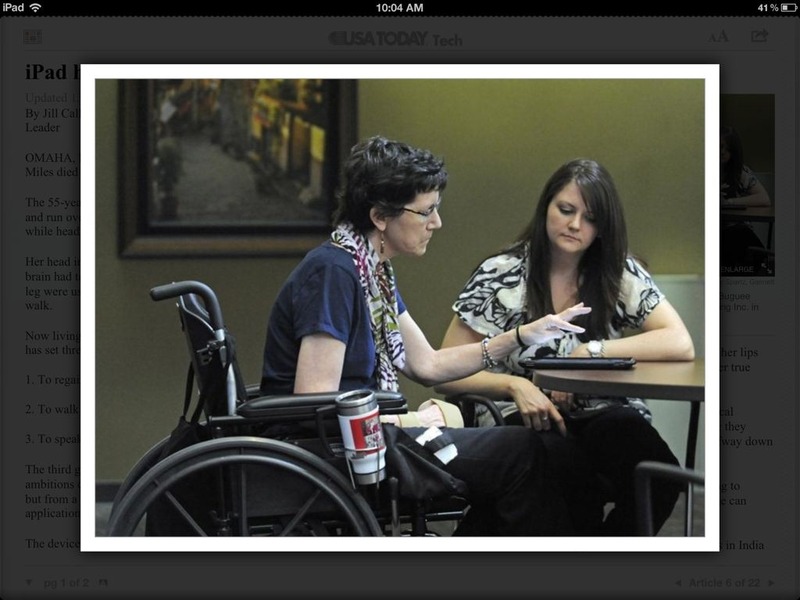 The article is about a strong, brave lady called Judy Miles, who was hit and run over by a pickup truck in March of 2011. She suffered horrific injuries and died on the operating table – twice. Yet she survived and is around now, lives at a rehab center, and has clear goals for her recovery that include walking more and speaking again. The device allows her to do something as ordinary as order her own coffee. It’s a simple act, but liberating to Miles and others who use assistive devices in their daily lives. "I felt very excited and relieved at the same time. 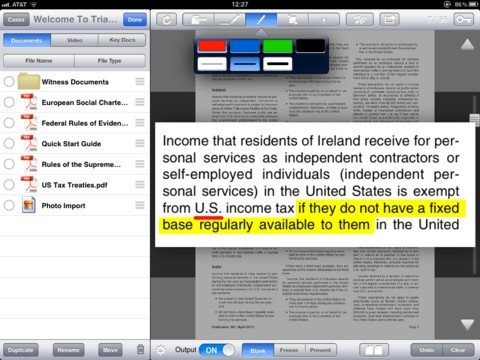 I finally have a way to talk," Miles says via iPad. "It has improved my life in many ways such as being able to pick out my clothes in the morning and being able to do simple things such as saying ‘hi’ to a friend." We can all admire the retina display, the latest mega iPad game, or a superb new productivity app – but it’s things like Judy Miles’ story and the incredible impact the iPad is having with autistic children that show what a truly amazing device it can be. 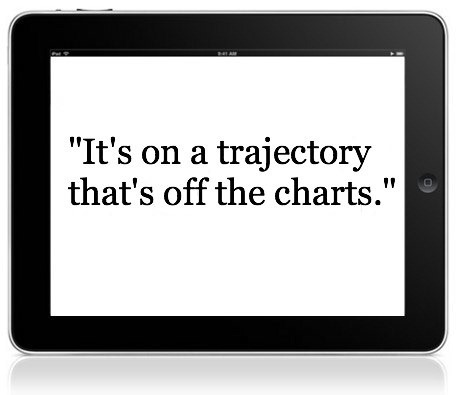 The incredibly broad and ever-increasing appeal of the iPad is an impressive thing to see. It started out as a big consumer hit and soon after it had huge traction in the enterprise. In the last couple of years we’ve seen it being used by local governments, businesses of all types, educational institutions ranging from K-12 all the way to blue-chip universities. It’s big in the healthcare arena too. I’m back from spending several days in Chicago for the American Bar Association’s annual TechShow conference. As always, I had a great time and met many readers and MPU listeners, which is kind of awesome. While last year, the iPad was a novelty at the conference, this year it almost appeared to be standard issue. Almost everyone had one. During my talk about technology at trial, I looked out to a packed room and was able to count the number of open laptops on one hand. Just about everybody else was using an iPad. It’s fun to see just how well than line stands up today – as the iPad has proved to be every bit as revolutionary (just ask makers of netbooks and PCs watching their market share get chewed up by it) as touted and its price has still not been beaten by any similarly-featured tablet. I’m excited about the iPad. I want one, and will certainly get one on Day 1, and I’m excited to blog about this new device and especially about the apps that will run on it and the uses we’ll find for it. I’m happy to say that I still feel that same excitement and enthusiasm for the iPad. It has proved to be even more of a game-changing device than I imagined. There are now over 180,000 apps designed specifically for the iPad and I’m still just as excited about finding the best of those as I was two years ago. Oh, and just a tad pumped up to see what Apple has in store for us with the iPad 3 this year.